As a kid, I had to take my music where ever I could get it. My entire music collection was comprised of a few records pilfered from alley ways on trash day and Columbia House rejects from when my dad neglected to check “no thanks” on the little card that announced it would be sending him cassette tapes by Huey Lewis, Kenny Rogers or A-HA. Thus my eclectic musical sensibilities. 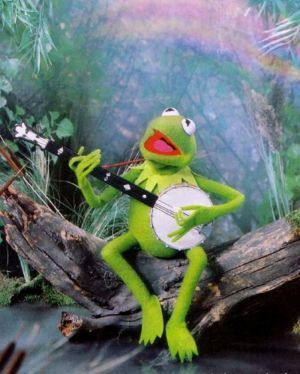 I must’ve listened to that Kermit record 100’s of times over the years and still have it somewhere. I sang a few remembered lines for RB and he says “Never heard it.” Never heard it? The computer was on my lap because I’d been working on my book before getting carried away with smoke and talk, so we make our way to youtube and hit play. And then it hits me — my own personal RAINBOW CONNECTION. Here I am, taking a break from the book, chatting about totally unrelated things, and ending up right back at the damn book. In Pure Sweet Chocolate Sense, one of the characters is a cop with “blue sense” who experiences psychic visions of a girl’s body trapped in a mine and the girl is wearing a jeweled rainbow around her neck. All of the characters are dealing with “knowing” and with the feeling that there is something more to be had, to be known. My characters and their maker/writer. The lovers, the dreamers and me! I did not recall the actual lyrics or think of “The Rainbow Connection” in relation to my book but connections were happening beneath the surface and I remembered every word some where. Kermit was poking at me no doubt. It’s the perfect Punk Rock Gospel for today because it has to do with the book and thus serves the gods of nanowrimo but is still a wonderful discussion of spirit and the search for something more. Plus Debbie Harry gives Kermie some punk rock props. Enjoy! What I really SHOULD be talking about in this Punk Rock Gospel Blog is the total human rights catastrophe of Prop 8 which is breaking my heart with its backward BS. I never dreamed that sucker would pass. I’m sick about it. And I have a lot to say on the subject of gay marriage as a human rights issue. Which I why I just can’t do that today when I’m 6 days behind in my 50,000 word marathon, having committed to the nanowrimo challenge for National Novel Writing Month. So I have no room for those words, also I have a one-track mind. So I’m going to share this Alexi Murdoch song from the perspective of Marchella, one of the characters in Pure Sweet Chocolate Sense. Kept hitting replay today, listening to the song “Dream About Flying”…. I have this aching attachment to it that is off-putting. It’s as if it’s not for me. But it must be cause I’m all that I have. I listen to it and I feel the agony and frustration of a mustachioed stranger. I feel his searching and his hiding. How he opens his eyes to the ceiling and feels like futility will eat him alive. Maybe it’s because I’ve been there — I’ve been that man. Of course that must be it, some part of myself searching for me and not finding me. Trying so hard, so hard, so hard. But I’m finally not hiding as much and hurting less. So maybe eventually that will bring that aching man that haunts my insides a little bit of peace. Wouldn’t it be wildly wonderful if the man isn’t internal but external, meaning that he really exists out there and the reason he’s searching for me is because I’m his one true love? His peace is me, finding me. And my peace is being found. He’ll gather me up, my bones & my secrets, my hard parts gone soft in his arms, and I’ll rejoice in my organic nature, in my earthling body self b/c he’ll be — FINALLY — my soft place to fall. Not that I believe in all that hoodoo, psychic visions or soul mates but my romantic mood of late has my mind mushy and hopeful. Oh, and go ahead and twitter all you blogosphere hipsters, cause yes I did get that “soft place to fall” from Dr. Phil — I admit it! But hey, the only reason you know that is because YOU’RE watching him too. Anyhoo. I wouldn’t mind having a little of what he and Robin have so I guess I’m not too cool for all that. It is a great song. He sounds so much like Nick Drake! Posted the lyrics too. Watch the u-tube clip!